Heinrich Wilhelm Friedrich Reincke was born on 17 May 1887 at Sauk, Wisconsin. He was the son of Johann Heinrich Friedrich Reincke and Anna Caroline Charlotte Louise Hahn. Heinrich Wilhelm Friedrich Reincke died on 11 August 1933 at Sauk, Wisconsin, at age 46. (?) Crawford married unknown (?). Married Name Her married name was Crawford. Unknown (?) married (?) Crawford. Married Name 1 October 1833 As of 1 October 1833,her married name was Stevens. Candace Partin married Edmond Stevens on 1 October 1833 at Wake, North Carolina. Candace Partin died after 1900. Edmond Stevens married Candace Partin on 1 October 1833 at Wake, North Carolina. Edmond Stevens died before 1900. James Nowell was born in 1767 at Johnston, North Carolina. He was the son of John Nowell. James Nowell married Letitia Wilder in 1789. James Nowell died in 1830 at Wake, North Carolina. Married Name 1789 As of 1789,her married name was Nowell. Letitia Wilder was born in 1771 at Mississippi. She married James Nowell, son of John Nowell, in 1789. Letitia Wilder died in 1840 at Wake, North Carolina. John Nowell was born in 1736 at Bertie, North Carolina. He died on 17 March 1793 at Johnston, North Carolina. Charles Jan married Mabel Louise Paulson, daughter of Carl Alfred Paulson and Hannah Larsen. Charles Jan was born on 14 December 1915 at South Dakota. He died on 7 January 1997 at age 81. [S373] U.S. Federal Census 1940 U.S. Federal Census, by Ancestry.com, Year: 1940; Census Place: Sioux Falls, Minnehaha, South Dakota; Roll: T627_3864; Page: 2B; Enumeration District: 50-47A. Roger Schiefen was the son of John Lawrence Schiefen. Roger Schiefen died before 1999. Name Variation Rosemarie Christine Meindl was also known as Rose. Name Variation Rosemarie Christine Meindl was also known as Meindle. 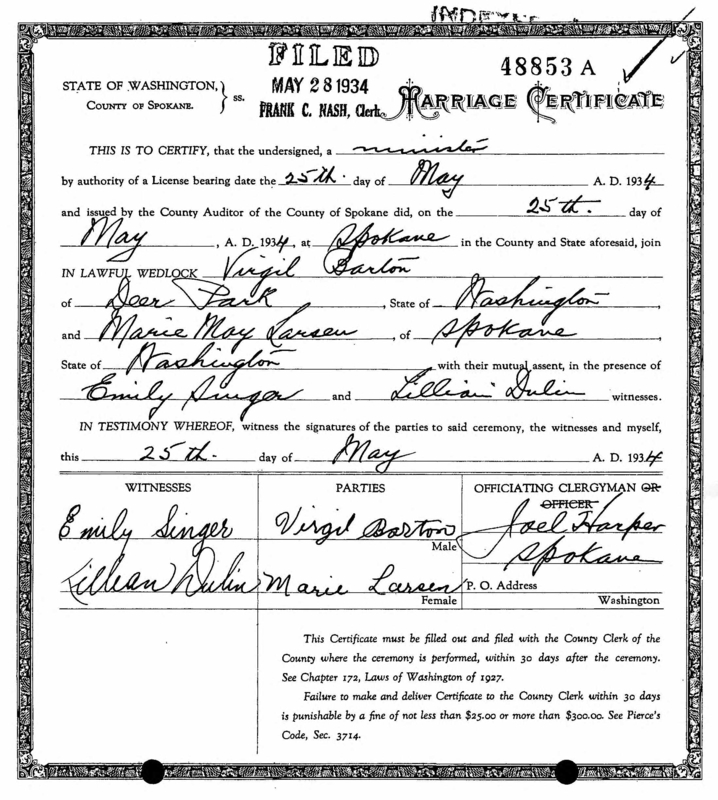 Married Name 27 April 1947 As of 27 April 1947,her married name was Larsen. Rosemarie Christine Meindl was born on 6 April 1921 at Milwaukee, Wisconsin. She was the daughter of Otto Meindl and Mary Cruse. Rosemarie Christine Meindl married Carl Russell Larsen, son of Carl Larsen and Johanna Pierson, on 27 April 1947 at Las Vegas, Nevada. Rosemarie Christine Meindl died on 29 November 2016 at age 95 Rosemarie Christine Larsen, 95, of Big Falls, Minn., died Tuesday morning, Nov. 29, 2016, at Bigfork Valley Healthcare, Bigfork, Minn.
Rosemarie was born April 6, 1921, in Milwaukee, Wis., to parents Otto and Mary Meindle. She went to a Lutheran school in Milwaukee through the eighth grade then to high school in Wauwatosa, Wis., graduating June 9, 1939. Rosemarie entered the United States Marine Corps in May 1944, stationed in Santa Anna, Calif., and was honorably discharged in April 1946. She was united in marriage to Carl Larsen on April 27, 1946, in Las Vegas, Nev. They lived on a mink ranch in Spicer, Minn., then moved to Milwaukee for two years, before moving to New London to a farm for one year. In 1954 they moved to Big Falls where they raised mink. She lived here until moving to the nursing home in Littlefork, Minn.
She was a member of the American Legion Post 494, the Women’s Auxiliary, and the Evangelical Covenant Church of Big Falls. Rosemarie was preceded in death by her husband, Carl in 1992; her parents, Otto and Mary Meindle; one brother, Don Meindle; one sister, Gen O’Quin; and one great-granddaughter, Alicia Larsen. She is survived by seven children; 14 grandchildren; 18 great-grandchildren; and three great-great-grandchildren. Funeral services will be conducted at 11 a.m. Saturday, Dec. 3, at Big Falls Evangelical Covenant Church. Visitation will be one hour prior. Interment will be at Evergreen Cemetery, Big Falls. [S250] U.S. Federal Census 1930 U.S. Federal Census, by Ancestry.com, Year: 1930; Census Place: Wauwatosa, Milwaukee, Wisconsin; Roll: 2599; Page: 24A; Enumeration District: 0378; FHL microfilm: 2342333. Virgil R. Barton was born on 31 October 1909 at Fall River, South Dakota. He was the son of George W. Barton and Anna Distler. 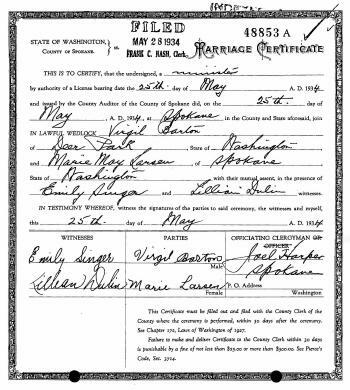 Virgil R. Barton married Marie May Larsen, daughter of Carl Larsen and Johanna Pierson, on 25 May 1934 at Spokane, Washington. Virgil R. Barton died on 26 June 2001 at Stevens, Washington, at age 91. [S373] U.S. Federal Census 1940 U.S. Federal Census, by Ancestry.com, Year: 1940; Census Place: Mill Creek, Stevens, Washington; Roll: T627_4364; Page: 1A; Enumeration District: 33-54. Name Variation Frederick William Fiedler was also known as Fred. 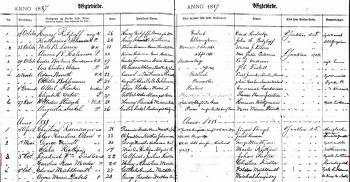 Name Variation Frederick William Fiedler was also known as Friederich Wilhelm. Name Variation Frederick William Fiedler was also known as Feiddler. Frederick William Fiedler was born in June 1866 at Russia. He was the son of Gottfried M. Fiedler and Justina (?). 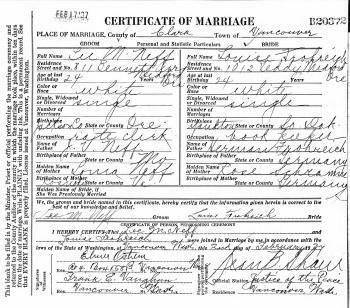 Frederick William Fiedler married Caroline Rose Mader, daughter of Henry P. Mader and Christina Misel, on 3 October 1888 at Trinity Lutheran Church, Rosenberg, Yankton, South Dakota. 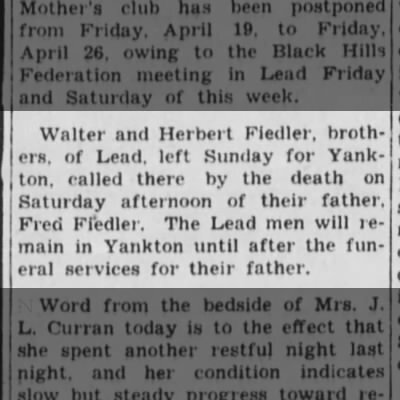 Frederick William Fiedler died on 13 April 1940 at Yankton, South Dakota, at age 73. He was buried after 13 April 1940 at Vangen Church Cemetery, Mission Hill, Yankton, South Dakota. 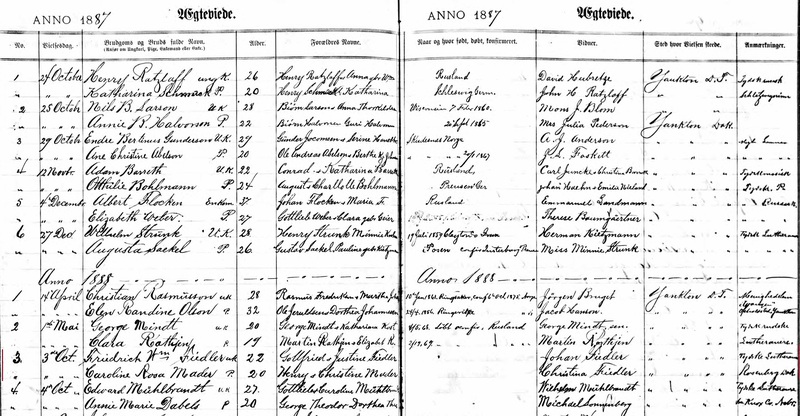 Arrival Date: 28 Jun 1876. Frederick William Fiedler witnessed the confirmation of Elizabeth M. Fiedler on 5 January 1919 at Vangen Lutheran Church, Mission Hill, Yankton, South Dakota. [S246] U.S. Federal Census 1880 U.S. Federal Census, by Ancestry.com, Year: 1880; Census Place: Yankton, Dakota Territory; Roll: 115; Family History Film: 1254115; Page: 499D; Enumeration District: 108. [S245] U.S. Federal Census 1900 U.S. Federal Census, by Ancestry.com, Year: 1900; Census Place: Volin, Yankton, South Dakota; Roll: 1555; Page: 9A; Enumeration District: 0350; FHL microfilm: 1241555. [S244] U.S. Federal Census 1910 U.S. Federal Census, by Ancestry.com, Year: 1910; Census Place: Twp 94 Range 54, Yankton, South Dakota; Roll: T624_1489; Page: 5A; Enumeration District: 0443; FHL microfilm: 1375502. [S243] U.S. Federal Census 1920 U.S. Federal Census, by Ancestry.com, Year: 1920; Census Place: Volin, Yankton, South Dakota; Roll: T625_1726; Page: 6A; Enumeration District: 263; Image: 877. [S250] U.S. Federal Census 1930 U.S. Federal Census, by Ancestry.com, Year: 1930; Census Place: Yankton, Yankton, South Dakota; Roll: 2232; Page: 10B; Enumeration District: 21; Image: 930.0; FHL microfilm: 2341966. [S373] U.S. Federal Census 1940 U.S. Federal Census, by Ancestry.com, Year: 1940; Census Place: Yankton, Yankton, South Dakota; Roll: T627_3870; Page: 11A; Enumeration District: 68-18. Married Name Her married name was Reinesto. Married Name Her married name was Gubert. Name Variation Laverne Kathryn Frohreich was also known as Katie. Name Variation Laverne Kathryn Frohreich was also known as Kathryn Laverne. Married Name 2 May 1992 As of 2 May 1992,her married name was Ludwig. Laverne Kathryn Frohreich married James Reinesto at 1st marriage for her. Laverne Kathryn Frohreich married Fiore Gubert at 2nd husband for her. Laverne Kathryn Frohreich was born on 14 February 1929 at Medford, Jackson, Oregon. She was the daughter of Hugo August Frohreich and Rosalia Weiss. Laverne Kathryn Frohreich married Marvin Ludwig on 2 May 1992 at 3rd marriage for her. Laverne Kathryn Frohreich died on 10 April 2003 at age 74 L. Kathryn ”Katie” (Frohreich) Ludwig of Bend died Thursday of cancer. She was 74. A memorial service will be held at 11 a.m. Wednesday at Cascade Terrace Clubhouse, 63700 Marlboro Dr., Bend. Mrs. Ludwig was born Feb. 14, 1929, in Medford to Hugo and Rosalie (Weisz) Frohreich. She attended schools in Medford and Grants Pass. She married Marvin Ludwig on May 2, 1992, in Winnemucca, Nev.
She worked as a bookkeeper, a saleswoman and in the medical field. Most recently, she worked at The Jewel in Sisters before her illness forced her to retire. She had lived in Bend since 1978. Mrs. Ludwig was an artist and enjoyed painting. She also enjoyed shopping, gardening and spending time with her family and friends. Survivors include her husband of Bend; a son, Mark Reinesto of Burr Ridge, Ill; two daughters, Debra Fuqua of Kansas City, Mo., and Janeen Fuqua of Bend; two sisters, Mary Jane Lathrop and Darlene Sayles, both of Sacramento, Calif., three grandchildren; and six step-grandchildren. She was preceded in death by her first husband, James Reinesto, second husband, Fiore Gubert, three sisters and two brothers. In lieu of flowers memorial contributions may be made to the Central Oregon Hospice, 2698 NE Courtney Drive, Bend 97701. Autumn Funerals is in charge of arrangements. [S250] U.S. Federal Census 1930 U.S. Federal Census, by Ancestry.com, ED48. Sheet 6A. [S373] U.S. Federal Census 1940 U.S. Federal Census, by Ancestry.com, Year: 1940; Census Place: Granite Hill, Josephine, Oregon; Roll: T627_3364; Page: 8B; Enumeration District: 17-9. (?) Frymire married Lois L. Dubs, daughter of Reinhard Jacob C. Dubs and Elsie Marie Frohreich. (?) Friesen married Mildred L. Dubs, daughter of Reinhard Jacob C. Dubs and Elsie Marie Frohreich. Lee M. Neff was born circa 1913 at Jackson, Oregon. He married Louise Hedwig Frohreich, daughter of Herman Frohreich Sr. and Rosa M. Schramm, on 2 February 1937 at Vancouver, Clark, Washington. [S373] U.S. Federal Census 1940 U.S. Federal Census, by Ancestry.com, Year: 1940; Census Place: Medford, Jackson, Oregon; Roll: T627_3362; Page: 7A; Enumeration District: 15-62. Married Name Her married name was Carrol. Catherine Zumwalt married (?) Carrol. Catherine Zumwalt was born in 1744 at Pennsylvania. She was the daughter of Johann George Zumwald. (?) Carrol married Catherine Zumwalt, daughter of Johann George Zumwald. Baby boy Mikkelsen was the son of Kenneth K. Mikkelsen and Arlene Margaret Adams. Baby boy Mikkelsen died at died in infancy. Norman C. Kirchhevel was born on 19 July 1927 at South Dakota. He was the son of Edward Kirchhevel and Helen Pfhal. 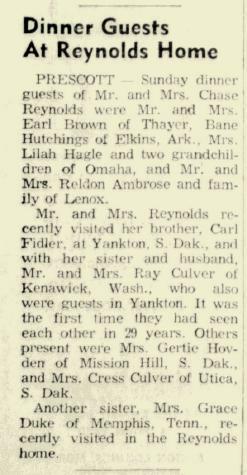 Norman C. Kirchhevel married Freda Beulah Mikkelsen, daughter of Lindhart Mikkelsen and Wilhelmena Augusta Frohreich, on 13 February 1955 at Charles Mix, South Dakota. Norman C. Kirchhevel died on 4 August 2006 at Hastings, Adams, Nebraska, at age 79. He was buried after 4 August 2006 at Harvard Cemetery, Harvard, Clay, Nebraska. Roy Ruiter was the son of Jelle Johnson Ruiter and Henrietta Jones. Roy Ruiter died before 1971. John de La Ronde married Elizabeth DeKaury. Married Name Her married name was de La Ronde. Elizabeth DeKaury married John de La Ronde. Name Variation Charles Franklin Hawkins was also known as Charley. Charles Franklin Hawkins married Maxine Hubbard. Charles Franklin Hawkins was born circa 1906 at Oklahoma. Married Name Her married name was Hawkins. Maxine Hubbard married Charles Franklin Hawkins. Maxine Hubbard was born circa 1910 at Montana. Married Name Her married name was Washburn. Married Name 1 August 1981 As of 1 August 1981,her married name was Tharaldson. Charleen Frances Hawkins married Bob Washburn. Charleen Frances Hawkins was born on 5 November 1934 at Montana. She was the daughter of Charles Franklin Hawkins and Maxine Hubbard. Charleen Frances Hawkins died on 1 February 2015 at Washington at age 80 Charleen Frances Tharaldson, age 80, of Colville, went home to be with her Lord on Feb. 1, 2015 in Colville. She was born on Nov. 5, 1934 in Jordan, MT, the daughter of Charles Franklin and Maxine (Hubbard) Hawkins.Charleen began her schooling at the Hell Creek School near Jordan, MT. Her family later moved to Oroville, where they re­sided for two years. In 1946, they relocated to Colville. Charleen completed Junior and Senior High School in Colville, graduating in 1953. She then worked at the Seattle First Na­tional Bank for three years before beginning a family with her husband, Bob Washburn. Charleen worked in the home raising her two children, Keith and Melody. On Aug. 1, 1981, Charleen married Gordon Tharaldson. For several years, she owned and operated the Magic Mirror Beauty Salon and weight loss center. In 1990, Charleen sold the beauty salon and became a Snowbird, en­joying winters in Arizona with Gordon. Due to her declining health, she and Gordon sold their winter home in Yuma, AZ and remained in Colville where they could be closer to family. Charleen enjoyed traveling. She and Gordon traveled abroad for over a decade to Israel, New Zealand, Australia, Hawaii and throughout the continental U.S. They also held timeshares and took many week-long excursions to Branson, MO, Scottsdale, AZ, Laughlin, NV, Hawaii and Palm Springs, CA. Charleen and Gordon shared their faith in a traveling min­istry throughout the states of Washington, Idaho, Montana and into Canada. She led in faith by her compassion and love of music. Charleen was also a gifted china painter with pieces of her work on display at the World Organization of China Paint­ers in Oklahoma City, OK. Charleen made the Holidays memorable with her cooking and abundant love of family.She is survived by her husband of 33 years, Gordon Thar­aldson, Colville; son, Keith Washburn, Colville; daughter, Mel­ody Radezky, Deer Park; step-son, Mark Tharaldson, Long Lake; step-daughter, Lorelei Day and her husband, Neil, Evans; brothers, Virgil Hawkins and wife, Connelea, Colville; Velmer Hawkins and wife, Bar­bara, Colville; five grandchil­dren, Troy, Jeremy, Joshua, Hannah and Rachael; six step-grandchildren, Wendy, Dean, Jeremy, Steve, Stephanie and Kurt; four great-grandchildren and nine step- great-grandchil­dren; numerous nieces and nephews. Charleen was preceded in death by a grandson, Bran­don; infant sister, Cheryl, and her parents, Charles and Maxine.A memorial service for Mrs. Charleen F. Tharaldson will be­gin at 11 a.m., Saturday, Feb. 14 at the Free Methodist Church in Colville. Her cremated remains will be interred at the Mountain View Park Cemetery, Colville. Memorial contributions can be given to the Free Method­ist Church, 336 E. 1st & Elm, Colville, WA 99114. Danekas Funeral Chapel and Crematory is entrusted with the arrangements. Name Variation Gertrude Fiedler was also known as Gertie. Married Name 17 April 1912 As of 17 April 1912,her married name was Hovden. Gertrude Fiedler was born on 14 September 1890 at Yankton, South Dakota. She was the daughter of Frederick William Fiedler and Caroline Rose Mader. 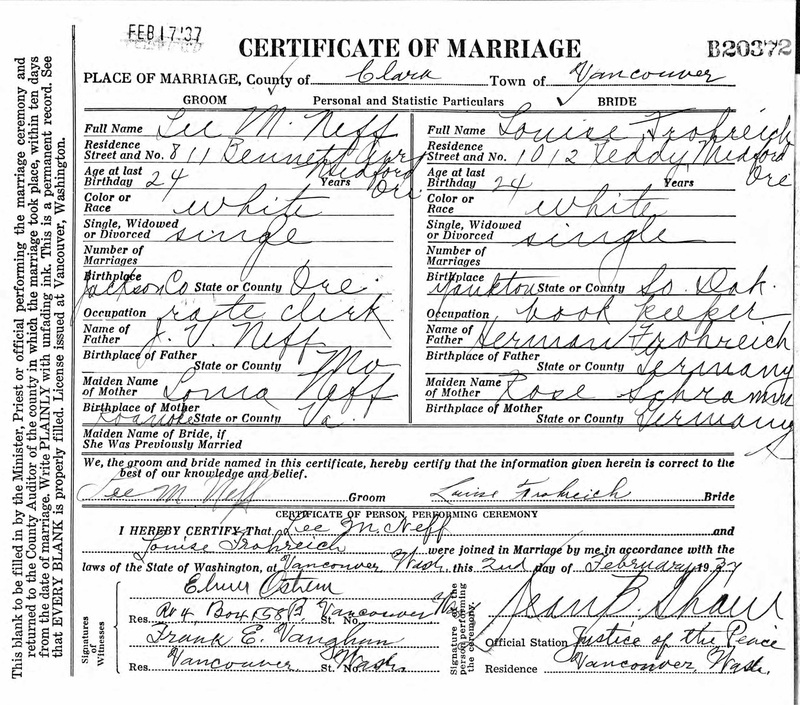 Gertrude Fiedler married Carl P. Hovden on 17 April 1912 at Yankton, South Dakota. Gertrude Fiedler died on 23 March 1979 at age 88. She was buried after 23 March 1979 at Vangen Church Cemetery, Mission Hill, Yankton, South Dakota. In 1965 at Prescott, Iowa, Mrs Chase Reynolds recently visited her brother Carl Fiedler and sisters Mrs Ray Culver, Gertie Hovden, Mrs Cress Culver and Grace Duke. [S243] U.S. Federal Census 1920 U.S. Federal Census, by Ancestry.com, Year: 1920; Census Place: Volin, Yankton, South Dakota; Roll: T625_1726; Page: 7B; Enumeration District: 263; Image: 880. [S373] U.S. Federal Census 1940 U.S. Federal Census, by Ancestry.com, Year: 1940; Census Place: Volin, Yankton, South Dakota; Roll: T627_3870; Page: 4B; Enumeration District: 68-16. Herbert Jacob Fiedler married Aletha (?). Herbert Jacob Fiedler was born on 15 July 1900 at Yankton, South Dakota. He was the son of Frederick William Fiedler and Caroline Rose Mader. Herbert Jacob Fiedler married Anna Schock on 23 July 1933 at Hand, South Dakota. 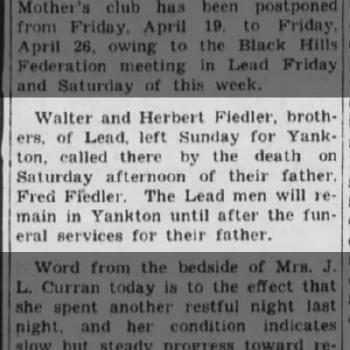 Herbert Jacob Fiedler witnessed the burial of Frederick William Fiedler after 13 April 1940 at Vangen Church Cemetery, Mission Hill, Yankton, South Dakota. Herbert Jacob Fiedler died on 28 April 1961 at Marion, Oregon, at age 60 H.J. Fiedler Succumbs to Heart Attack--Herbert J. Fiedler, 775 17th St. NE, died Friday in a Salem hospital following a heart attack at his home. He was 60. Fiedler came to Salem 20 years ago from South Dakota and was employed for the past 10 years at Oregon State Tuberculosis Hospital. He was born at Mission Hill, S.D. He leaves a widow, Mrs. Aletha Fiedler, Salem; one son, Dale Fiedler, and one daughter, Mrs. Gwendolyn Barr, both of Chehalis, Wash; three brothers and seven sisters including Edward Fiedler and Mrs. Elizabeth ?, both of Los Angeles; Walter Fiedler, Mountain View, Calif; Mrs. Josie Colver, Kennewick, Wash; Mrs. Tillie Neilsen and Mrs. Sally Culver, both of Eureka, Calif; two grandsons. Arrangements are pending at Howell-Edwards mortuary." He was buried after 28 April 1961 at Lee Mission Cemetery, Salem, Marion, Oregon. On 12 September 1918 at World War I Draft Registration, Yankton, South Dakota.